Friday Frugal Finds: $3 mirror, 25¢ placemats, $3 wall décor, and much more! Lots of finds to share with you this week! Some from yard sales and some from thrift stores. So here goes! I stopped in quickly at Value Village with my nephew and found some good finds. Then on Saturday I headed out yard saling! This was at a yard sale in a neighborhood near my house. Then I stopped at my parking lot yard sale. These Christmas placemats came in a set of 4 and still had the tags on them. Guess how much she said she wanted for them? 25¢ for ALL FOUR! What is that like 6¢ each? Going to enjoy using these at Christmas! When I realized her prices were so cheap, I took a second trip back through her booth! wood centerpiece thing – 25¢. Couldn’t find anything else at her booth that I couldn’t live without unfortunately – although I LOVED her prices! Stopped at one more yard sale on my way home. This was at a house that we drive by all the time and I love the way she has her porch decorated. So when I saw she was having a sale, I knew she would have good stuff! And I made a quick stop at the flea market! One of my favorite booths had told me he was going to have a house full of stuff to set out so I was anxious to see what he had. Lots of fun deals! 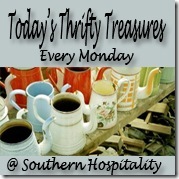 I will be showing you how I put some of these and some of my I love thrifting day finds to use in my home next week. I have the exact wooden stand thing–got it at goodwill a few months back, and I LOVE The ornate mirror! I just recently got one simliar (but oval-shaped) and spray painted it TURQUOISE–I LOVE the pop of color it adds! =) Loved seeing your great finds!